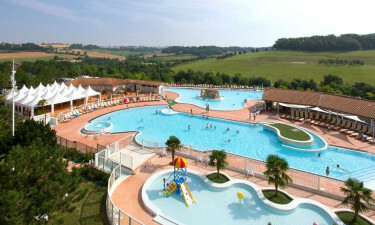 Thanks to its convenient location in the heart of the Midi-Pyrénées and excellent amenities, Le Lac des 3 Vallees is one of the best possible introductions to the world of luxury camping. Fresh mountain air, beautifully landscaped surroundings, and a warm welcome await you at Le Lac des 3 Vallees. Experience the best of the Midi-Pyrénées region with a luxury camping holiday at this campsite. The team at LUX-camp is ready to help you book an unforgettable stay in this beautiful French region. A calm and peaceful atmosphere in a scenic rural location. Le Lac des 3 Vallees is a Yelloh Village property where quality accommodation, friendly service, and top-of-the-range facilities come as standard. A range of fully equipped cottages and mobile homes in spacious and landscaped plots. A 2,500 square metre waterpark that offers guaranteed fun for every family member. Kids will love the pool area water slides and toboggans, whereas adults can indulge in a hydromassage or jacuzzi session. 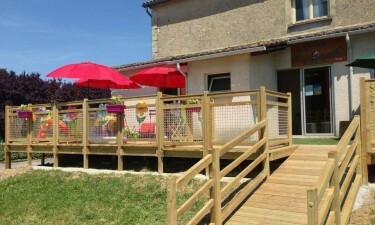 Le Lac des 3 Vallees offers a selection of mobile home units and cottages designed to offer superb comfort levels. Choose among 1, 2, and 3-bedroom units whose living space ranges between 16 and 40m2. All mobile homes and cottages at this campsite feature a fully equipped kitchen, indoor and outdoor living areas, and a full bathroom. Le Lac des 3 Vallees is built around three lakes that provide the ideal backdrop for numerous holiday activities, like fishing, swimming, and canoeing. The lakeshores feature lush green areas where you can enjoy a round of mini-golf, go cycling, or sunbathe. 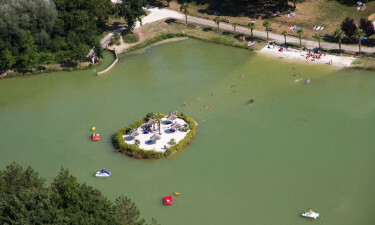 Moreover, Le Lac des 3 Vallees is a pet-friendly campsite, as one of the campsite's three lakes is specially reserved for guests who travel with their dogs. The concepts of pampering and relaxation are taken to a new level at the campsite's wellness centre, where guests can treat themselves to luxurious hydromassage sessions, professional massage treatments, or chill out at the sauna and jacuzzi facilities. A wide range of beauty treatments (manicure, pedicure, skin treatments, etc.) are also available on-site to help you feel and look amazing during your holiday. The campsite's restaurant has a scenic location overlooking one of the lakes and serves traditional French cuisine and local specialties. The restaurant features a pleasant outdoor bar area where you can sample a glass of Armagnac or your favourite drink. For informal meals, you can choose between the campsite's pizzeria and a snack bar that offer take away meals. Good quality produce, delicious baked goods, toiletries, newspapers, and souvenirs can be found at the campsite's shopping area, which consists of a convenience store, a supermarket, and a bakery. Only 5 kilometres away you will find the hilltop village of Lectoure, known for its farmers market and specialty shops.